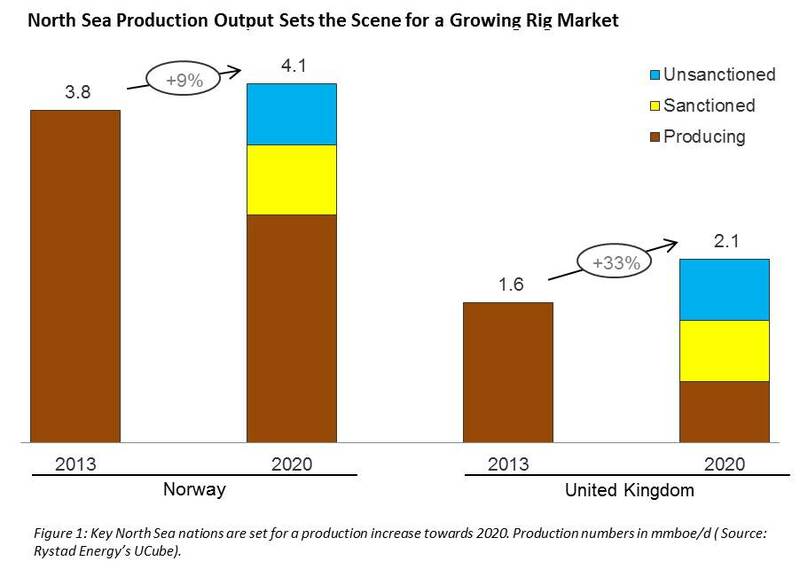 For the North Sea countries Norway and the UK, the rig market has grabbed the interest and attention of the industry. This is due to expected increasing production, resulting in extensive drilling activity and leading to higher rig and drilling demand over the next years. So what is the production forecast for these countries, and how does this translate to a blossoming rig demand? The key North Sea countries Norway and the United Kingdom produced 3.8 and 1.6 million barrels of oil equivalents per day (mmboe/d) respectively in 2013. These two countries including all their provinces are referred to as the “North Sea market” for the remainder of the article. Going forward, both countries are expected to see a production increase. In 2020, Rystad Energy assesses the Norwegian production to reach a total of up to 4.1 mmboe/d. Of this, 64% will come from fields that are currently producing, while 19% will come from fields currently under development. The remaining production will come from discoveries not yet sanctioned. The UK production is expected to increase towards 2.1 mmboe/d in 2020. Of this, only 31% will come from assets currently producing, while 35% will come from fields currently under development, and the remaining 34% from currently unsanctioned projects. To achieve the forecasted production, extensive drilling activity will be required going forward. Development drilling of the fields currently sanctioned will be a key driver of rig and drilling demand in the near term, while development of the non-sanctioned discoveries will be a key driver as we approach the end of the decade. In the near term, these fields will require appraisal activity as well. Countering the natural decline of the currently producing fields will require a significant amount of infill drilling on these fields as well, and we see operators paying increased attention to their legacy assets. Exploration drilling will continue to require rigs and drilling services. In 2013, around 40% of the drilling demand in Norway and the UK were driven by exploration activity. Although highly oil-price dependent, we expect this activity to maintain at high levels, but loosing overall market shares towards development drilling. Rystad Energy defines the North Sea moveable drilling unit (MODU) market to include floater- (semi-submersible and drillship) and jackup rigs. The total fleet currently counts some 70 units in the two main markets combined. Transocean is a clear market leader with a total market share of almost 25% of the combined Norwegian and UK markets. 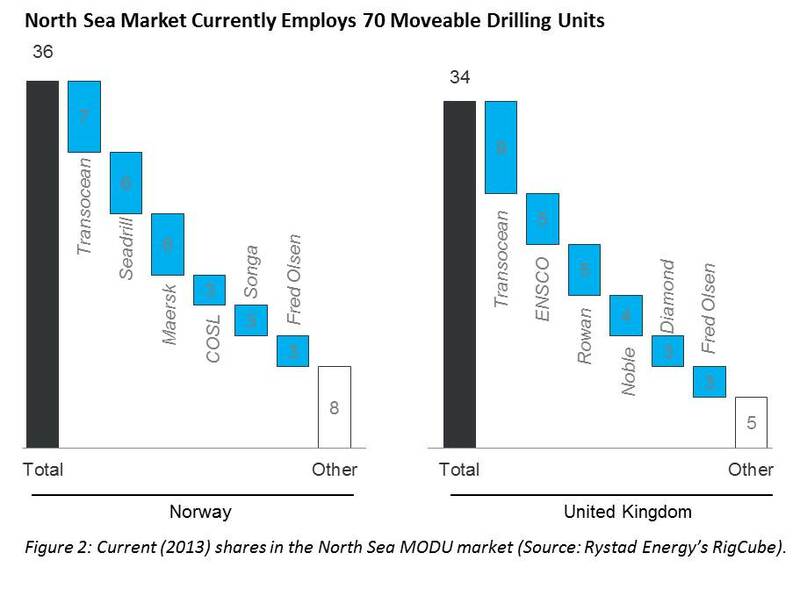 The Norwegian rig market currently employs 36 floater and jackup drilling rigs, while the UK market employs 34. Figure 2 displays the top 5 rig owners in Norway and the UK. The figure further shows that the Norwegian rig market is mainly supplied by three players: Transocean (7), Seadrill (6) and Maersk (6) supplying above 50% of the total fleet. On the other hand, 55% of the UK market is served by the three main players Transocean (9), ENSCO (5) and Rowan (5). The offshore rig fleet in Norway is largely focused towards floaters, with 25 floaters and only 9 jackups operating in the Norwegian part of the North Sea. This is in contrast with what is seen in the UK, where the market is equally split between floaters and jackups with 17 rigs from each of the two categories. The composition of the fleets largely reflects the water depth exposure of the activities in the two nations, with the UK exposed to shallower waters driving jackup demand. 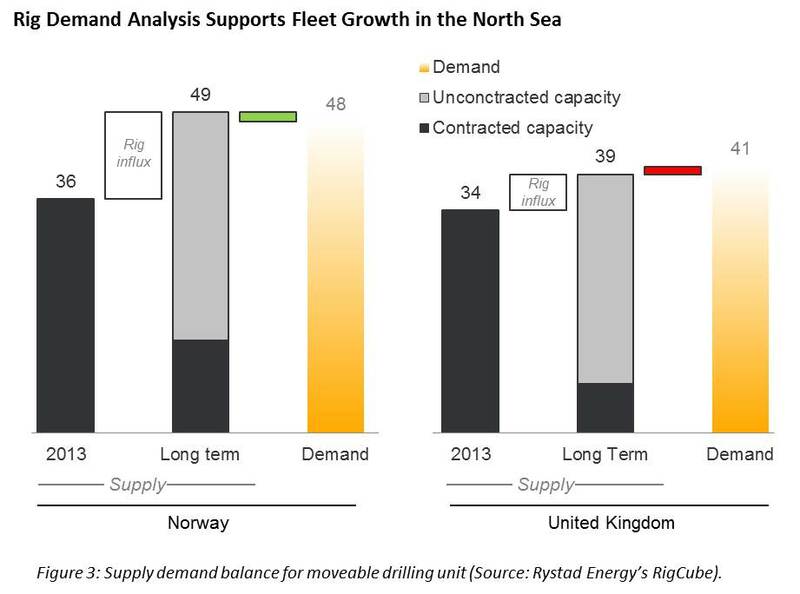 In both Norway and the UK, the fleet of available moveable drilling rigs is set to grow in the coming years (Rystad Energy defines “long term” in figure 3 as 4-6 years from now). This is driven by contractual additions of rigs adding to the current available fleet. While the supply of rigs in Norway is expected to increase from the current 36 towards 49, the UK supply is expected to increase from 34 towards 39. With only 29% and 19% of the available fleet contracted long term in Norway and in the UK respectively, the question arises on how many rigs the industry will demand in the long term. Our analysis suggests the fleet increase is necessary to meet the increased demand expected going forward, as such expecting all units to be employed in the long term. Rystad Energy has assessed the development drilling needed to meet the projected production increase in the two regions, through a field-by-field assessment of development and infill drilling requirements. This, in addition to exploration drilling demand, will require a large step up of drilling activity for both regions, as indicated in the charts above. We see the long term situation in these markets as balanced. The capacity seems available to meet the growing demand but the availability will be challenged by (a) competition from other regions and (b) retirement of older rigs. Only minor portions of the long term supply is contracted, and operators will have to actively firm up new contracts in the coming years to secure capacity needs.